I've never really been a cook. Seriously. Before moving to Germany and having significantly more time to dedicate to hausfrau pursuits, I was the kind of girl who could burn water. This new way of focusing on food, more for its enjoyment than as a rushed afterthought at the end of a 12-hour workday, has really blossomed into a love of cooking I never thought I would possess. Now, I not only tear through each new issue of Bon Appetit with a voracity that I used to reserve for the likes of fashion magazines, but somewhere along the line, I actually got brave enough to start experimenting. And this, ladies and gentleman, was the first of such creations. Simple, easy and delicious. It's my baby, in the kitchen sense. I hope you enjoy it as much as I do. Heat 2 tablespoons each of sesame oil and soy sauce in a large non-stick skillet or wok over medium-high heat. Add shallots, garlic and pepper and cook until softened, about 5-7 minutes. Add chicken, with a bit of salt, freshly ground pepper and a tablespoon of Sriracha to taste. Sauté until chicken is cooked through. Reduce heat to medium. Add veggies and a drizzle of both sesame oil and soy sauce on top, cover and let steam for about 5 minutes (I like my veggies with a bit of crunch, but cook longer if you prefer softer results). Remove from heat and stir. 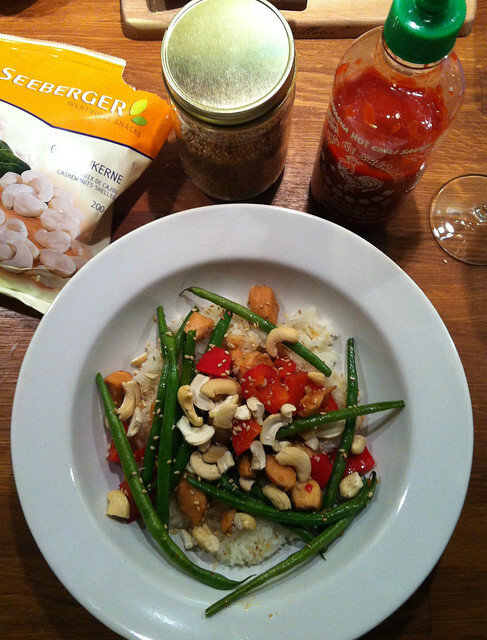 Serve over rice and sprinkle with roasted sesame seeds, cashews and Sriracha to your liking.